SiriusXM has announced that legendary rock band KISS will perform an intimate invitation-only show for SiriusXM subscribers and VIPs on Monday, February 11th at LA’s famed Whisky a Go Go on the Sunset Strip in Los Angeles. The exclusive performance will air on KISS’ exclusive SiriusXM channel, KISS Army Radio. The special concert for SiriusXM will feature KISS performing songs from the band’s 45 year career. This marks the first time KISS has played a club in over twenty years and will be their first performance at the world famous Whisky a Go Go in Los Angeles, the venerable rock club on the Sunset Strip that has played host to rock ‘n’ roll’s most important bands and artists, from The Doors, to Janis Joplin, to Led Zeppelin, as well as today’s emerging new artists. The performance will air on Tuesday, February 12th at 5 pm ET on KISS Army Radio, channel 30, and through the SiriusXM app on smartphones and other connected devices, as well as online at siriusxm.com. The concert will air on Howard Stern’s Howard 101 channel on Friday, February 15th at 9 pm ET. KISS Army Radio will launch on Monday, February 4th at 5 pm ET via satellite on channel 30 and will run through Sunday, February 17th. After an epic and storied 45-year career that launched an era of rock n roll legends, KISS announced that they are hanging up their nine inch tall touring boots. Known for their trademark larger-than-life blistering performances, KISS has proven for decades why they are hands down the most iconic live show in rock n roll. The Rock & Roll Hall of Famers who have sold more than 100 million albums worldwide and have toured to nearly every city on the planet and played every venue imaginable have said this tour is devoted to the millions of KISS Army fans. 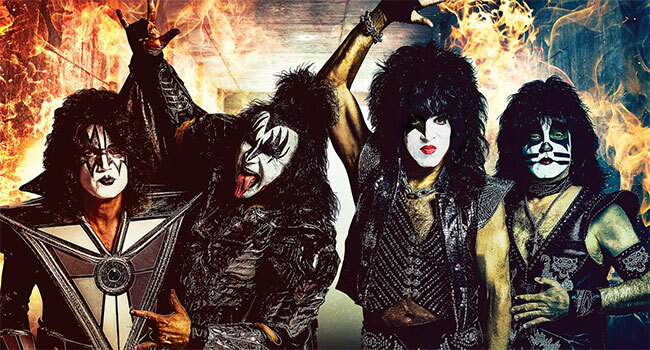 Having played for Kings & Queens, for U.S. veterans, and for millions of devoted KISS Army fans, they will play their final shows as part of the multi-year End of the Road Tour. Subscribers will have the opportunity to win tickets to this private SiriusXM performance through an invitation sent by e-mail. Subscribers since January 2, 2019 will be able to enter for the chance to win a trip for two to Los Angeles, LA including airfare, hotel stay and a pair of tickets to SiriusXM Presents KISS at Whisky a Go Go. SiriusXM subscribers are able to listen to KISS Army Radio (channel 30) on SiriusXM radios, and those with streaming access can listen online, on-the-go with the SiriusXM mobile app and at home on a wide variety of connected devices including smart TVs, Amazon Alexa devices, Apple TV, PlayStation, Roku, Sonos speakers and more.